Atlanta Trout Bite On Fire! After exiting I-285 in North Atlanta we’d driven past a Zaxby’s, Waffle House, Hardees, Dunkin Donuts and a slough of other fast food restaurants, all well known in the Deep South. People sported Atlanta Falcons and Georgia Bulldog stickers on their cars. Downtown Atlanta, Turner Field, The Georgia Dome and Centennial Park were just miles away. A day ago temperatures rose in the nineties. Humidity was unbearable. You guessed it. We were going trout fishing – minutes from the concrete jungle they call Hotlanta. And, I’m sure every car we passed expected us to be chasing catfish, bass and panfish. Georgia Peaches are common. Georgia trout, or at least Atlanta trout, not so much, most beleive. 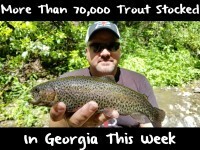 Contrary to popular belief, Atlanta sports one of the country’s top urban trout fisheries. It’s a dream tailwater fishery downstream of Lake Lanier. A place where wild brown trout and planted rainbows can live year-round, even when temperatures soar into the 100s and humidity pushes most humans to the limit. Weaving beneath the traffic filled I-285 and 75, the Chattahoochee River is stuffed with trout, all thriving in cool, refreshing water sucked out of Buford Dam. More than 50 river miles of the Hooch support large populations of trout and while the fishery is partially managed as a put-and take by the Georgia Department of Natural Resources, most residents have no idea so many trout reside here. Meanwhile, much of the trout community is taking note, some have for decades. This isn’t new to many. There’s plenty of river occupied by fly anglers chasing wild browns, but many are coming to catch dinner and nearly 150,000 trout planted annually keep success rates high, particularly for those with the ability to wade, kayak, canoe or launch small boats. The river is wide in many places and bank fishing can be a challenge in some spots. Others, limits can be taken quickly within inches of park roads. The river is stocked March through Labor Day, but trout remain year-round as temperatures flirt with 50 degrees almost all year. In fact, when we fished last Thursday, there was what seemed to be an endless number of trout in the region. We fished in two small boats, roughly 20 yards from each other and caught fish on almost every drift. No exaggeration, we kept some and released dozens, all planted eight and nine inch rainbows, with a few better than 10 inches. We launched at the Jones Bridge Boat Ramp and found trout to be plentiful from roughly a quarter mile upriver on downstream for a quarter mile. We didn’t go further downstream in order to avoid the rapids (and not being able to motor back to the ramp). Fortunately, trout can be found for dozens of miles downriver. In town to film Pautzke Outdoors on the Hooch, almost every trout we caught came on Gold Label Balls O Fire salmon eggs. For fun, we drifted Orange Deluxe and Yellow Jackets just to see how quickly they’d grab them after seeing the Gold Label and it only took seconds to get bit. The trick to catching Hooch trout in the fall is locating the current lines, seams and runs. The trout aren’t in the slow, shallow water and if you cast there, you won’t get bit. Fortunately, the water here isn’t too clear, either, meaning you don’t need four-pound test to be successful. 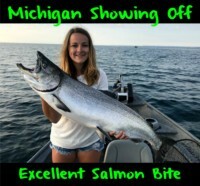 We found success using six-pound test, with split shots with bait holder and salmon egg hooks and either a float or split shot. Normally, we catch trout on salmon eggs drifting naturally in the current. However, on the Hooch, the most bites came with the split shot resting on the bottom and not drifting at all. They wanted the eggs so bad they gobbled them up while they were at rest, which I’m not used to seeing. And, most importantly, a sign the fall bite has just started. Bring your eggs, however. We each went through a full jar and found that loading four or five on the hook rather than one drew more strikes. Editor’s Note: Anglers are allowed to keep eight trout, yes eight, per day. A trout stamp is required. A PHD in regulations is required to understand the booklet that the state publishes. However, rest assured, bait is legal from below the boat ramp at the Medlock Bridge Park on downriver, all year. 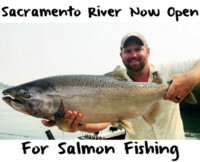 If you fish upriver of that launch ramp, consult the state’s regulation page online: http://www.georgiawildlife.com/node/1307.